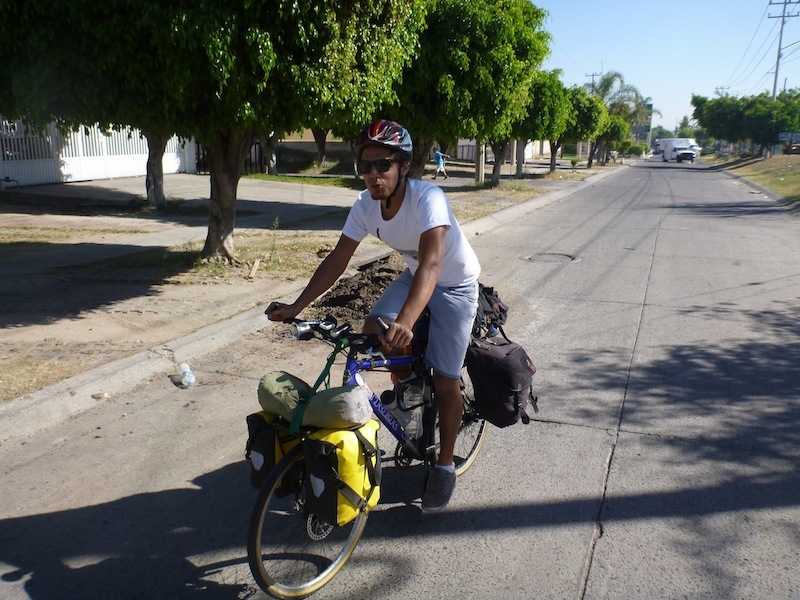 When I finally got around to hauling Tony’s fat arse out of the Casa Ciclista Guadalajara we didn’t head out on the road alone. Jorge, Sofi, Izahk, Marcos and I headed south together to Ajijic on the shore of Laguna Chapala to partake in a Temazcal ceremony. To mix things up a bit I didn’t ride Tony down to Ajijic, Izahk did. Izahk was keen to try riding a fully loaded touring bike, and after 10 km on Tony he was determined to finish the job and ride tony all the way to Ajijic. It’s a pretty flat 50 km ride to Ajijic except for one pretty decent hill just before you arrive. Izahk struggled a bit on the way up that climb, as you can see in this short video I took, but he did great and eventually made it to the top. Marcos in front of the oven. 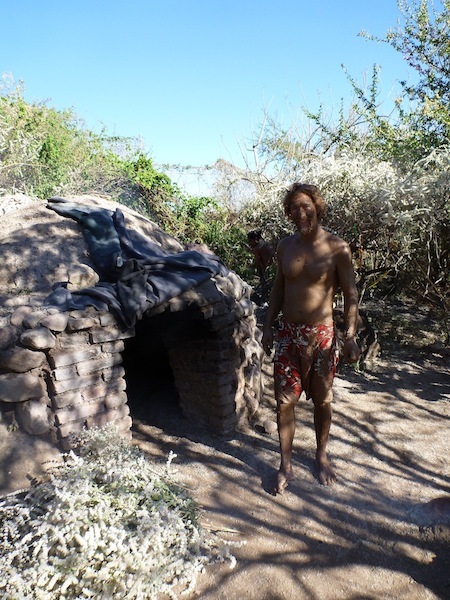 The venue for the temazcal is in a small clearing out in the bush, and the only permanent structure is an oven built with brick and earth. The place has a very Carlos Casteneda feel to it. The oven is used to cook people. 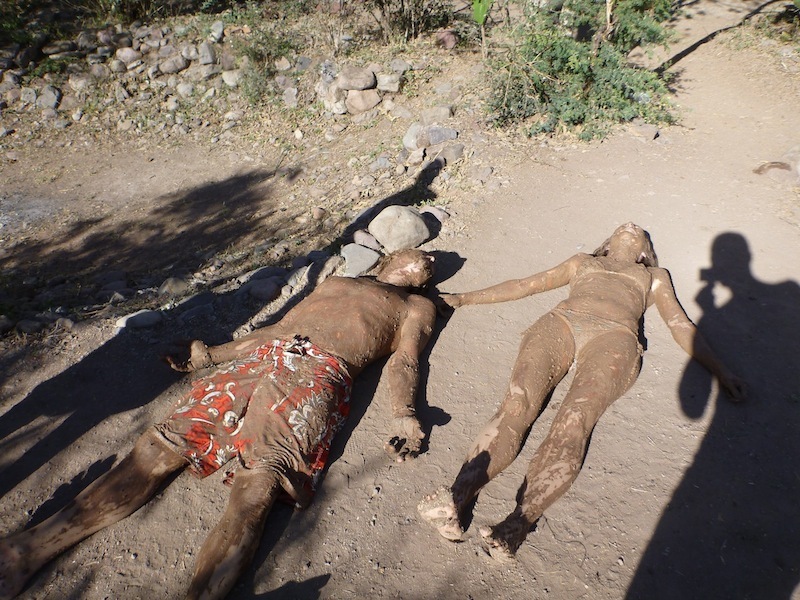 Temazcal is an indigenous cleansing ceremony that is similar to a sauna. That’s all I knew about it when we arrived. It turned out to be much more involved. First you strip down to your boardies and proceed to cover yourself (and each other) with mud. Then you lie out in the sun until the mud dries out. Then you rinse off before crawling into the oven along with everyone else. The door way is covered up such that it is completely dark inside the oven and then water is splashed on the hot rocks to turn the oven into a suana but with an extremely intense heat. I often had to breathe through my mouth to avoid burning the insides of my nostrils. Once you feel like you will never ever be cold again, the ceremony starts inside the oven. The “shamans” (for lack of a better word) bring in musical instruments and start the spiritual cleansing. With the extreme heat and the complete darkness, the banging on the drums is a very intense experience and leaves you with a feeling akin to that of being on some pretty serious drugs. The next part of the ceremony is the naming of names. In the darkness each person introduces themselves and gives a short speech/prayer talking about the things they are thankful for, mentioning people they are thinking about in that moment, and asking for their safety and good health. (For me, the fact that all of this was being done in spanish added to the power of the experience.) When the heat begins to be too much to bear everyone leaves the oven, is rinsed off with ice-water and then re-enter the cave for another round. In the second round, the chanting begins. Despite the solemn and intimate quarters of seven people squeezed into a small space, the complete darkness and intense heat provide a measure of anonymity which helps with the releasing of inhibitions and soon we were all humming and yelling and screaming and singing together. For a lot of people two rounds is sufficient, but some of us went in for round three. After the third emergence from the cave, you are rinsed off with ice water again and you then immediately go to strip down naked, wrap yourself in a sheet, and lay down in the fetal position for 15 mins before eating some fresh fruit and re-entering the real world. I am sure that each and every one of us went through our own unique inner journey during this experience. For me though, the main feeling I took away from the experience was that we are all human beings and we are all equal. We all struggle with the same weaknesses and the same fears, we all have similar desires of love, happiness, and finding our place in the world, and we all have beauty inside of us. Through the cleansing we were all reduced to the same thing: a naked human being wrapped in a sheet. But there can be no shame in this inherent truth and through the process I felt my inhibitions and self-consciousness being sucked out of my pores as they were revealed to me in that moment to be the silly byproducts of an introverted and ego-centric mind. Wrapped up in that sheet I could see that honesty on the deepest level – with yourself and with others - brings with it an unprecedented freedom. The next day, all of us smelling fresh and beautiful, it was time for Tony and I to say “Hasta Luego” and ride on towards Mexico City, 800 km away. 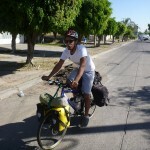 We were looking forward to getting there as it would mark the end of Stage 3 of the Tour de Zack, AKA Operation: Tequila! Tequila! after almost 15 weeks since leaving La Paz, BCS. On our Journey to D.F. we will be stopping in on the cities of Guanajuato, San Miguel de Allende, and Queretaro, right smack dab through the middle of Mexico; never again on the Tour de Zack y Tony will we be getting further from the ocean. After Queretaro, we will need to tackle some serious mountains to get to the largest city in Latin America. D.F. itself is quite high at an elevation of 2400m. To get there though one must cross over higher mountains and, depending on the route you take, these roads climb up to over 3000m.